Devon Fireworks Displays Round Up is your best list when Looking for Bonfire Night Firework Displays, this post will guide you to finding firework displays easily within Devon. To make it easy, we have added a Table of Contents – So you can quickly navigate to your local Devon area. We have also added a change log, If at any point we take away or add an event, it will appear in that section. Time: Gates ticket holders, 5.30pm, Fireworks, 7.30 pm. Venue: Topsham Rd, Exeter EX2, UK. What’s on Kenniford Farm hog roast, barbecue, Music, Doughnuts van, Trampoline. Price: TBA. Learn More: View Here about Exeter Golf & Country Club Fireworks event. Time: Gates: 4:00 pm, Junior Fireworks: 6:00 pm, Bonfire: 7:00 pm, Main Fireworks: 7:45 pm, Closes: 9:30 pm. Venue: Carn Brae, Abbotsham, Bideford EX39 5AP, UK. What’s on Food, Fire, Fun, Junior Fireworks, Playground. Price: Tickets available from September. Learn More: View Here about Exeter Golf & Country Club Fireworks event. Venue: Ottery Saint Mary EX11. What’s on: Local fun, fireworks, Flaming barrels. Learn More: View Here about The Tar Barrels event. For a safe fun night at any of these Devon Fireworks Displays Round Up 2018 Please follow the rules, as most displays do not allow to sell or buy fireworks or allow animals. Please take extra care if you are attending on your own, take the extra money and a mobile phone for emergencies only. Did you enjoy this post? Please share it with your friends. Would you like more? 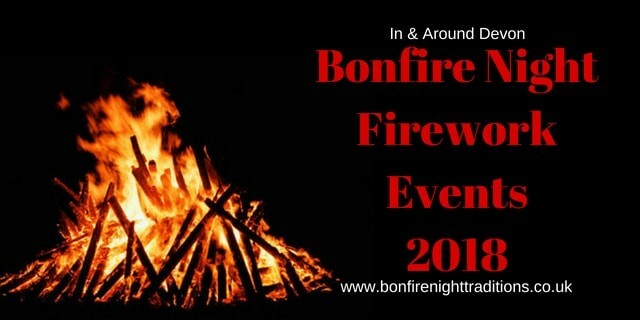 join us on the Bonfire Night Firework Displays in Devon Facebook group. Where you can share all the latest Devon events are happening.